A mission statement is one of the most important aspects of a business. It is basically a summary of what the business is all about, what the business covers, the products and services offered by the business, as well as the primary target market of the business. In short, it is a basic explanation as to why the business exists. Developing your very first mission statement or making revisions to an old one can be quite a handful and can be quite a pressure. But doing so can actually help you and the rest of the company’s workforce remember what is important and what is the main goal of the company. You can also like vision statement samples. If you are a newbie when it comes to writing mission statements or if you need a quick refresher course on how to write one, we are here to help you out. Just keep reading this article and you will surely finish writing that mission statement in no time. Your mission statement is just as important as a detailed business plan. However, unlike a long business plan, a good mission statement is composed of a few succinct statements that successfully summarizes what the business is all about. 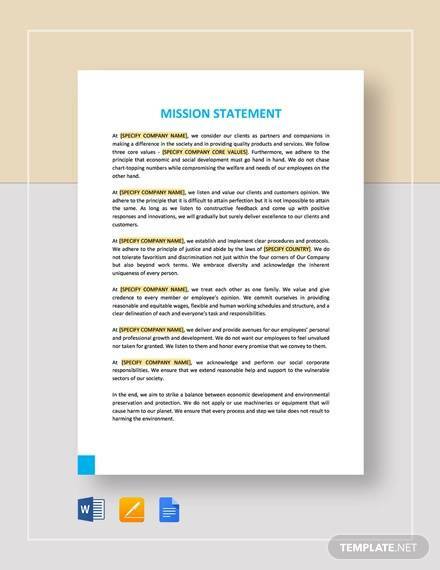 In this section, we will give you a few tips on how you can write your company’s mission statement. As simple as that. Just talk about what your company does, who your business is for, and what you wish to achieve in the long run. There is no need for you to write everything about your business, but you should include what your business produces and who your business is for. You can also like personal brand statements. You will also need to define why your business is different from others that are in the same industry. If you are having a bit of trouble coming up with what you should include in your mission statement, make a quick list of what your company does. This way, you will be able to compress the similar ones and ensure that your mission statement remains compact yet strong. You can also like billing statement samples. Your mission statement must be able to define how your business does what it does and how it is able to cater to the needs of your customer. It does not have to be a detailed description of the day-to-day operations carried out by your business. Remember, the mission statement is a summary of what your company is and what it does. A general statement of how your business operates. When it comes to this part of the mission statement, think about the core values that your business has and incorporate it accordingly into the mission statement. Make sure that everything you incorporate is based on facts to ensure that you are able to meet customer expectations accordingly. Step 3: What Does Your Company Does for the Employees? Aside from the fact that your business mainly caters to the target market, you should also include how your business’s employees benefit from what your company does. Remember that your employees are the pillars that help you get the turnover that you would need. You have to emphasize that you go for equality, respect ideas, empower, and do not discriminate. Now that you have a quick draft or list of what you will be writing your mission statement, it is now time for you to put it all together. What you need to do first is to cut down on the number of words that you currently have in your draft. You can format it in a way that makes it easy to read by making use of bullets, lists, numbers, and breaking up big groups of statements into smaller paragraphs. You can also like cash flow statements. Keep an eye out for any misspellings and any grammatical errors to ensure that before you publish your mission statement. Be on the lookout as well for jargon and other terms that might be hard to understand. Remember to also cut back on other aspects that may seem a little unnecessary to be a part of the mission statement. You have to make sure as well that you believe in whatever it is you are stating in your mission statement. You can ask others to read through your mission statement and ask for constructive criticism so that you can improve it more should there be a need to. The mission statement serves as the guide that you, as well as your employees, can use your mission statement as a basis as to what they should do in order to reach the smart goals of the company. Your mission statement will help to let you and your employees know what is the direction that you want to take for your business. Your mission statement helps to let your employees and target market know what it is you provide and how they can benefit from it. Your mission statement can help you create a good business marketing strategy that can help you gain more returns for your business. Your mission statement can also help minimize any confusion and ambiguity about what your company does and what it is all about. You can also like diversity statement samples. A well-written mission statement can be a means of motivating your employees to do better or maintain doing a good job. 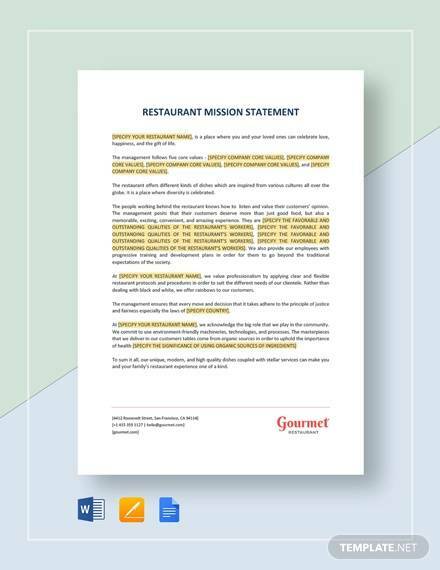 Your mission statement can also aid in helping you come up with a good employee evaluation form that can help you track if your employees are currently doing the job that they have been assigned to do. Now that you have come to the end of our article, we hope you have learned a lot by reading it. We also hope that you have now become less nervous or stressed about coming up with your very first mission statement or that it helped you revise your current mission statement. As the years go by, you will find that there are a lot of changes that will happen to your business and that is fine. As changes in your business happen, there will also be constant changes that will happen to your mission statement, so go ahead and make those changes. You can also like financial statement samples. Go ahead and publish your mission statement now! Start posting it on your website, social media accounts, and around the bulletins of the office. What Are Strategic Plan Templates?